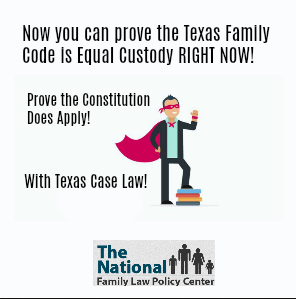 Does the Texas Family Code Already Call for Equal Custody? HOW DO YOU GET EQUAL CHILD CUSTODY IN TEXAS? Justice Puryear further argues that the Standard Possession Order is intended to apply as the maximum for parents who qualify only as a possessory conservator, whereas the SPO is minimum for JMCs. The legislature has implemented this policy through the following directive to courts “[t]he terms of an order that denies possession of a child to a parent or imposes restrictions or limitations on a parent’s right to possession of or access to a child may not exceed those that are required to protect the best interest of the child.” Tex. Fam. Code Ann. § 153.193 (West 2002) (“Minimal Restriction on Parent’s Possession or Access”) (emphasis added). In order to protect children’s abilities to have a meaningful relationship with their parents, the legislature determined that the standard possession order would set a presumptive minimum amount of time for possession of a child by a joint managing conservator parent. Id. § 153.137 (West Supp.2004-05). In its instructions how to apply the “guidelines established in the standard possession order,” the legislature repeated its characterization of the periods as the minimum guaranteed to a joint managing conservator. Id. § 153.251 (West 2002) (standard order is “intended to guide the courts in ordering the terms and conditions for possession of a child by a parent named as a possessory conservator or as the minimum possession for a joint managing conservator”) (emphasis added). Did you know that Texas was the first state to have a Family Code? Texas had a Family Code in 1967. Justice David Puryear is a justice in the Texas 3rd Circuit Court of Appeals and is currently up for re-election. He is the longest sitting justice in the 3rd Court of Appeals and wrote the most opinions of any justice in 2015 and 2016. You can click here for Justice David Puryear’s campaign page. All attorneys can start to change the outcome for their parents right now today. All attorneys and parents should read Justice David Puryear’s concurring opinion, In Re J.R.D., and incorporate it into their pleadings and their oral presentation to the court for child custody prior to your trial.